Most of us have asked ourselves this at some point. You know you have this bad habit of eating out more than you should. You probably know you could be saving money by packing a lunch or making coffee every morning. But how much of a difference would this really make? Would it actually save you enough money to be worth it? Every time I sit down with friends to help them put together a budget, the first place I look at is their spending on food. Most people spend an insane amount of food on casual eating out. I’m not even trying to convince them to stop celebrating special occasions, but if they could just stop buying takeout every other night for dinner they could probably save hundreds every single year. Over the past year I’ve seen this idea explode among various “financial independence” platforms and groups. People chasing after financial freedom have realized how much their eating habits and food spending can have a huge impact on their ability to increase their savings rate. 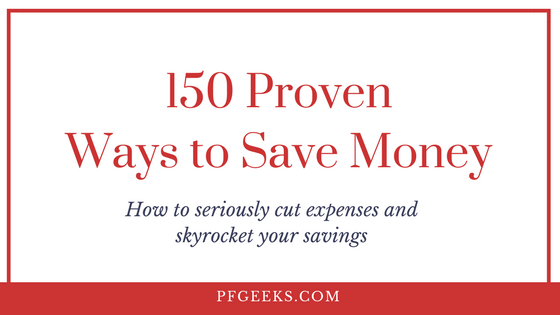 If you’ve never taken the time to calculate your savings rate, then I would absolutely recommend checking out this guide by 20 Something Finance. It’ll help give you a baseline to work from and improve off of. I truly believe that meal prepping is one of most life-changing habits to step on the gas and fast track your way to Financial Independence! For average Americans, meal prepping alone could help them save an additional $215,000 for retirement. Does Meal Prepping Save Money? Nothing shocks me more than when I read articles or see statistics on the financial life of the average American. The amount of debt, the lack of retirement savings, and the financial choices that people make blow my mind. And when we look at what the average person spends on food, it’s no wonder that the typical person has so many financial problems. In fact, when it comes to food, the idea of average is so far off the tracks that it is insane. The average household spends $3,008 annually – on eating out. What if you stopped throwing away food that you had already paid for? Maybe those numbers don’t jump off the screen at you as significant, but track with me as I walk through them. If you just considered eating your food instead of throwing it away, you’d be saving yourself $640….each and every single year. 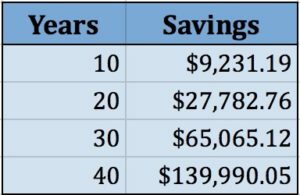 This may not seem like a big number in the grand scheme of things, but imagine what $640 each year could do for your retirement savings. If you contributed that into your 401K or IRA each year and earned an average annual return of 7%, after 30 years you would have over $64,000 saved for retirement. The chart to the right has a breakdown of how much money meal prepping could save you just by not throwing away the food you’ve already paid for. What would it take for you to start meal prepping? An hour a week planning out your meals. A planner such as Plan to Eat or the one my wife uses can be all the difference. A planner like this only costs a few bucks and if you really feel like saving the money, make a list in the notes app on your phone. Grocery shopping with this plan in mind. This is probably where most people fail. They go to the grocery store, buy what they think they might cook, and then it sits in their fridge for weeks on end until it eventually gets thrown away. Spend a few hours a week meal prepping. For some, the idea of cooking can be intimidating, but it doesn’t have to be! A few minutes on youtube can teach you nearly every cooking technique you need to know. Eat your food! Does this need any elaborating? There’s no doubt that for most people restaurant spending can fall into a few categories. Between birthday parties, work outings, celebratory dinners, and date nights, there will always be a reason to eat out. Add to this our desire for good tasting and convenient food and its no wonder that the average person spends thousands of dollars a year at restaurants. Eating has become a social activity. No longer are you paying for the food, but now we also pay for the experience, the ambience, and the company you are with. There will be life events at overpriced restaurants that you can’t or won’t want to miss, but what if those special occasions were built into your budget? The best place to start is by racking up some smaller, daily wins. Other than special occasions, what do you think is the biggest reason people eat out? I honestly don’t know if there is anything that kills our budget more than our desire for convenience. Instead of making coffee before work, we buy it on the way. Rather than wake up 20 minutes earlier to eat breakfast, we grab something on the way. Instead of packing a lunch, we eat out with coworkers. And by the end of the work day, we’re too tired to grocery shop, let alone prepare and cook another meal, so we pick up food on the way home. At my first job, it was normal for my co-workers to eat out 5 days a week. I told myself that I’d rather skip on Chick Fil A and Freebirds with people I spent most of my waking hours with so that I could have one special date night a week with my new wife. We were able to enjoy those pricier, first year of marriage date nights because I passed up on the daily work lunches that had become part of the office norm. Now let’s think out loud about this insanely high $3,000 yearly bill for eating out. What if we were able to cut that in half? I’m not suggesting you cut 100% of your eating out budget because we both know that isn’t realistic for most people, but all I’m suggesting is that you consider cutting your restaurant spending down from $250 to $125 per month. Cut out the work lunches. Cut out the morning Starbucks run. Stop picking up take-out on the way home. Now, let’s see what happens when we take that extra $1,500 you just saved and let compounding do its magic. Combined with your savings from earlier, you are now investing an extra $2,140 each year, or roughly $180 every single month! After 30 years you will have over $215,000 more in your retirement account! 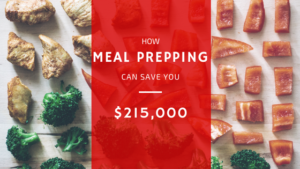 If having an extra $215,000 in your retirement account is worth it to you, which I hope it absolutely, without a doubt would be, then I hope you’ll check out our Ultimate Guide to Meal Prepping. Want to save more money on meal prepping? Have you ever heard of Ibotta? Ibotta is an awesome app that helps you save money on groceries. All you have to do is download the app, find offers that work for you, snap a quick photo of your receipt, and you’ll start earn cash back! Get $10 for free if you sign-up today! Seriously do it. I just saved about 10% on all of my protein for this week. You can check out our review and get our unique ibotta referral code. My wife had a roommate before we were married that spend more than $200 per week on food for one person! Crazy! I spend less than that to feed a family of 5! Good for y’all! $200 a week is crazy! Not difficult if that includes eating out though. We definitely need to work on lowering our food budget. The main killer for us is my meat consumption.